Are you ready for the Cataclysm?! I put my account on hold many months ago and have been thinking of coming back for the expansion. I miss all you guys, even Cleff. Ok well.. maybe that's an overstatement. Maybe I will have some time around the holidays to reload the game and grab the expansion and see what's what. Hey, don't flatter Clef with an extra f.
Don't worry, it's just the R's (and vowels) that are worth anything. I wonder why the compososed-of-nothing-but electrons Kindle version is $12.99 while the resource-using paperback version that can be shared but not deleted is $7.99? Does this pricing make me want to buy a Kindle? Well, I am pretty sure I know why, but it still doesn't make sense. Because product pricing decisions involve a matrix of inputs that are far, far, far more complicated than "this one's made out of paper and that one's made out of electrons?" Lawn darts were used in the pricing decision. You wasted the lawn darts on product pricing? WTH are we supposed use to defend ourselves from the lawn gnomes?? The SS50. A fine model indeed! I soaked many a neighbor with that thing. Gives me a bigger target to swing. I might even break out my 1-iron for this, or a driver. No, no, that is too rational. I prefer to view my world as SISO - single input, single output - preferably on terms and using standards that I set myself based on my whims at the time. So, the electonic version is more expensive because the publisher is mean. Classic thread, I laughed so hard! I am sooo not ready!! I didn't even know they were breaking Azeroth until today... Now I'm glad I went to ZG last night, but sad I didn't run around and see everything as it was just one more time. This is going to be like a brand new game! Yeah I was sad after the fact that I didn't run around but my heart wasn't in it. ZG is still going to be there, Kimmie, just none of those bosses and presumably different or non-elite trolls. I was going to go watch the moon rise over the Barrens one last time but I upgraded my video drivers and went to bed instead, lol. Isn't that beautiful? 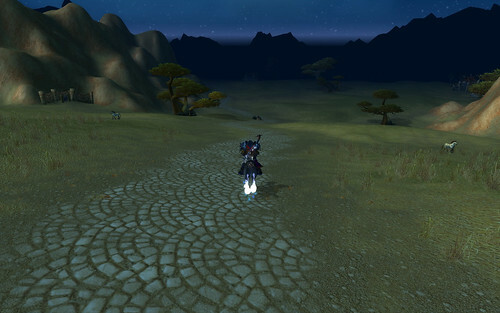 The first screenshot I ever took was of a full moon over the Barrens. I'd climbed up a hill and got a bunch of shots of the landscape and night sky. Clearly Blizzard wasn't ready. Maintenance extended until 5pm PST. I was feeling nostalgic running the Pilgrim events, watching the events in Stormwind, etc. They're doing a great job building up to this, and it did bring lots of memories, I felt a little like that guy in Cinema Paradiso when I went back to Goldshire looking for turkeys. One of those silly level 8 Defias aggro'ed on me, I remember what I tough time I had with them, pretty funny now (come to think of it, I should have looked up old pal Hogger). The mood of doom and gloom around Stormwind was amazing. When one of the citizens said "what's happening to us" I felt the same way. It will be kinda sad to see it all gone. We're just gonna have to get the Deathwing for doing this. I didn't get that many old world screenshots but I went through my screenshot collections and pulled them all into an set on flickr.